First impressions count. And when it comes to one of the biggest purchases any one of us will make, it is paramount. While most sellers hone in on ensuring that their interiors are market-ready (rightly so), they often oversee the aspect that potential buyers see first – the front of the home! So how can you ensure that your curb appeal is top notch? From removing any old, worn, or busy items that no longer have a place to making minor updates to the home such as a clear number on the mailbox or a new door mat, treat your exterior like your interior and before anything else, give your front yard a good decluttering and clean up. Remove leaves, mow the lawn, and maintain the weed growth. Pressure wash the driveway to remove engine oil and other debris. Give the walls and windows a wash with your garden hose (I know, when was the last time that happened?? ), look into updating door fixtures like locks and door handles and repair any worn or torn fly screens. This is also the time to assess if your home needs a fresh coat of paint, as a dull façade is not appealing to someone looking to make a house a home. Getting the basics right sets the stage for your home to look its best from the get-go. Lighting plays a key role to ensuring your house is seen in a welcoming manner – too dark and it looks like a haunted mansion (we don’t want that), too bright seems sterile and uninviting. Ensure that if bushes or shrubs are blocking windows that they are given a trim down to tidy up so that the landscape is clean and during the day maximum natural light is entering rooms. From dusk to dawn, ensure you have properly placed lighting. You’d be surprised at how many potential buyers do drive past after work just to have a peek at the property, so if the property is dimmed your well-planned landscape design will disappear. The competition is tough, full stop. This means that it’s essential to set your home apart both from your neighbours’ and the other homes on the market by adding something special. Add some personality in order to make your home instantly recognisable to potential buyers while still keeping in line with your overall theme. 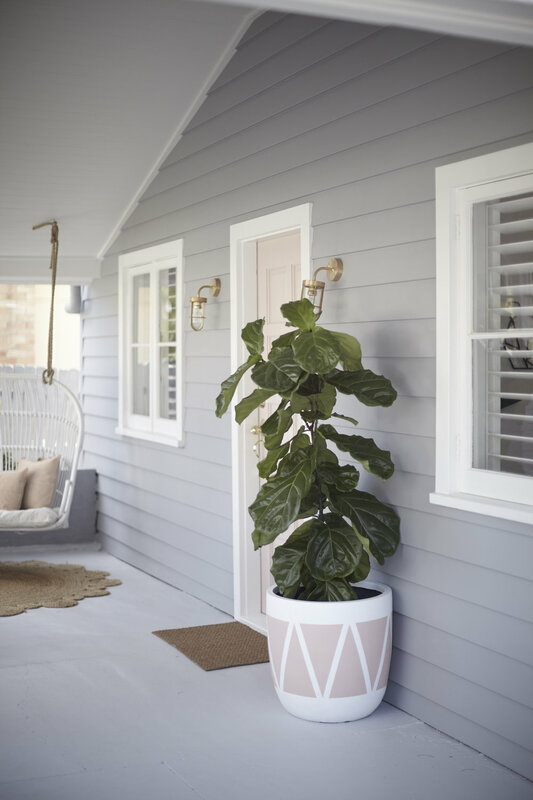 It can be as simple as repainting the front door, or adding a large statement pot of plants. Regardless of how you choose to execute, infuse curb appeal into your home by adding the right amount of “pop”. Use your home’s current themes to implement these simple steps so that you’re maintaining a welcoming, homey feeling throughout your home – both internally and externally. By doing so, you’re showing potential buyers that your house is ready to become their home!